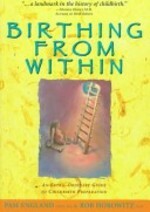 People credit Birthing From Within as their guide to having the birth they always dreamed of having. A holistic approach to childbirth, it is written by Pam England, a certified nurse midwife and registered nurse, and helps take the modern approach to birthing—the hospitals, the clinical detachment, the money and drugs and impersonality of it all—and spins it around back to its personal, emotional roots. Birthing, after all, is a truly emotional process—one that every woman and man should be able to fully participate in. Imagine being able to do it all your way, without someone telling you that your baby must be delivered a certain way, or that you cannot be the first person to hold your newborn. Why Are Pregnancy Books So Terrifying?